Odyssey of the Mind is a hands-on program for kids where only the 7 minds of the team can work on the long term solution. The basic premise is when the team members solve the problem 100% by themselves, they learn to solve challenges within their capabilities, be resourceful and they develop a tremendous amount of self-confidence. While well meaning, outside assistance subtly tells kids they are not capable of doing it themselves. 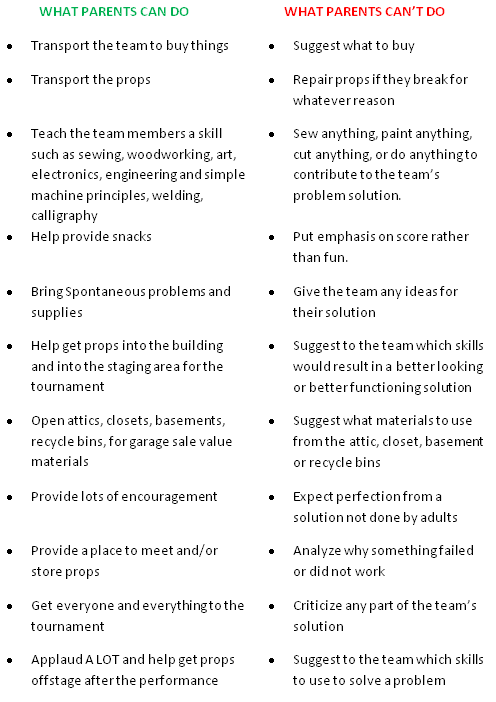 When the Team’s solution is the Team’s idea, their design, their work, their performance, and their score, they are much more likely to develop 21st century skills to help them be successful now and in the future. Remember, in the end, the Team is responsible for what they do, not the coach, parents or people outside the team.